The TOEFL Speaking section lasts 20 minutes and includes six tasks. The individual tasks will be described in more detail in the next section. You won’t be speaking to a real person during this section. Instead, you’ll hear recorded conversations and respond by speaking into a microphone. After your exam, your responses will then be listened to by TOEFL graders. Each question receives a score from 0-4. These scores are then added together and scaled from 0-30 for your total Speaking section score. Your Speaking section score makes up 25% of your total TOEFL score (out of 120). This section tests your ability to speak effectively in academic settings. You’ll be graded on how well you answer each question, your ability to speak clearly and coherently, and your vocabulary and grammar. What Types of Questions Are on TOEFL Speaking? There are three different types of TOEFL Speaking questions, two tasks for each type. In this section, we explain the format and content of the tasks and give an official example question and response tips for each question type. The first two tasks are independent speaking tasks that draw on the student’s own ideas, opinions, and experiences when responding. For each of these questions, you’ll be given 15 seconds to prepare and need to speak for 45 seconds. 1. Talk about a pleasant and memorable event that happened while you were in school. Explain why this event brings back fond memories. You won’t get much time to prepare for these first two tasks, so you’ll have to think quickly. Don’t try to figure out all the details you’re going to discuss in 15 seconds. Just settle on a topic to talk about, and let the details come naturally while you’re speaking. If you run out of things to talk about and there’s still time left, don’t be afraid to make things up! There’s no rule that you can only discuss facts. As long as you’re speaking, it doesn’t matter whether what you’re discussing actually happened or not. The remaining four tasks are integrated tasks. Students must use more than one skill when responding. Tasks 3 and 4 require students to read, listen, then speak. You’ll be given 45 seconds to read a short passage, then you’ll listen to a short lecture (about a minute in length). After that, you’ll have 30 seconds to prepare, and you’ll then need to speak for 60 seconds. (Male professor) I think this will help you get a picture of what your textbook is describing. I had a friend who taught in the physics department. Professor Jones, he retired last year………….Anyway, I remember…………… this was a few years ago ……….. I remember passing by a classroom early one morning just as he was leaving, and he looked terrible: his clothes were all rumpled, and he looked like he hadn’t slept all night. And I asked if he was OK. I was surprised when he said that he never felt better, that he was totally happy. He had spent the entire night in the classroom working on a mathematics puzzle. He didn’t stop to eat dinner: he didn’t stop to sleep …………….. or even rest. He was that involved in solving the puzzle. And it didn’t even have anything to do with his teaching or research; he had just come across this puzzle accidentally, I think in a mathematics journal, and it just really interested him, so he worked furiously all night and covered the blackboards in the classroom with equations and numbers and never realized that time was passing by. These are often considered the trickiest TOEFL Speaking questions because they contain three parts: reading, listening, then speaking, all in a short time frame. The most important tip for these questions is to take good notes while reading and listening. You want to have their information briefly summarized so that when your preparation time starts, you can use it to figure out how you’re going to respond and not waste time going back and trying to figure out what the passages said. When answering these questions, pay careful attention to any differences between the information in written passage and the information in the audio clip. These differences are often an important part of your response. The final two TOEFL speaking tasks require students to listen then speak. For these two tasks, you’ll first listen to a short audio clip. You’ll then have 20 seconds to prepare, and you’ll need to speak for 60 seconds. (Female professor) Human beings aren’t the only animals that use tools. It’s generally recognized that other animals use tools as well………. use them naturally, in the wild, without any human instruction. But when can we say that an object is a tool? Well, it depends on your definition of a tool. And in fact, there are two competing definitions—a narrow definition and a broad one. The narrow definition says that a tool is an object that’s used to perform a specific task ………… but not just any object. To be a tool, according to the narrow definition, the object’s gotta be purposefully changed or shaped by the animal, or human, so that it can be used that way. It’s an object that’s made. Wild chimpanzees use sticks to dig insects out of their nests ……… but most sticks lying around won’t do the job ………… they might be too thick, for example. So the sticks have to be sharpened so they’ll fit into the hole in an ant hill or the insect nest. The chimp pulls off the leaves and chews the stick and trims it down that way until it’s the right size. The chimp doesn’t just find the stick ………… it………….. you could say it makes it in a way. But the broad definition says an object doesn’t have to be modified to be considered a tool. The broad definition says a tool is any object that’s used to perform a specific task. For example, an elephant will sometimes use a stick to scratch its back ………. it just picks up a stick from the ground and scratches its back with it…………… It doesn’t modify the stick, it uses it just as it’s found. And it’s a tool, under the broad definition, but under the narrow definition it’s not because, well, the elephant doesn’t change it in any way. Question: Using points and examples from the talk, describe the two different definitions of tools given by the professor. For tasks 5 and 6, you’ll use many of the same tips for answering as you did for tasks 3 and 4. These tasks, since there is no written passage, tend to have longer audio clips, so it’s important to be able to quickly summarize the main points of the clip in a few notes so that you’re ready to speak when the timer starts. Throughout your response, you should mention specific parts of the audio clip to strengthen your answer. If you’re already confident with your English speaking skills, you may feel like you don’t need to study for this section. However, preparation is key for most people to ace this section. Keep these four tips in mind while preparing in order to get the most out of your studying. The most important thing you can do to practice for the TOEFL Speaking section is to practice speaking English regularly. If you can practice every day, that would be ideal, but at the very least you should aim to practice speaking English 2-3 hours a week. Remember, this speaking practice doesn’t only have to consist of answering TOEFL Speaking questions; any conversation, even a casual chat with friends, where you’re speaking in English counts. The vocabulary you use is an important part of your TOEFL Speaking score, so it’s important to not just repeat the same handful of words when you speak. You don’t need to sound like a thesaurus, but including a few less common and more challenging words in your responses can help boost your score. 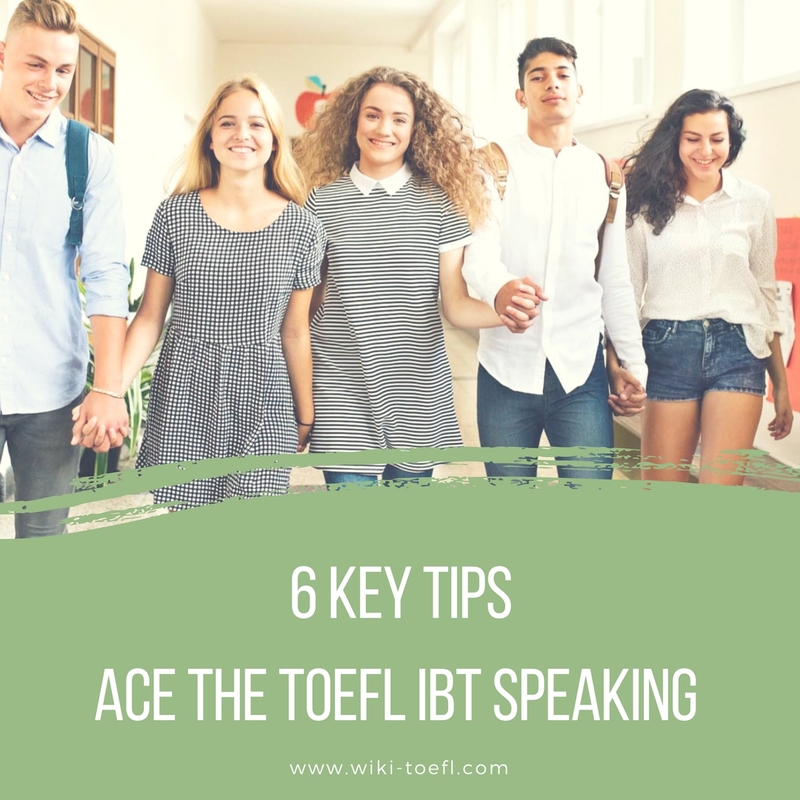 You don’t want all your awesome preparation to go to waste on test day, so on the day you do take the TOEFL, keep these final tips in mind during the Speaking section. You’ll be given between 15 and 30 seconds to prepare for each task, and you want to be sure to make the most of this time. During your preparation time, jot down points about the main points you want to make. Don’t try to write out everything you want to say. You won’t have enough time, and reading from a script will sound unnatural and lose you points. For the four integrated tasks, make note of any specific points you want to mention from the audio clip/written passage. Be sure to finish your notes in time so that when the timer ends and you have to begin speaking, you’ll be able to start your response right away. Many people feel nervous when they take the TOEFL, particularly during the Speaking section. There’s also pressure to fit in as many words as you can in order to gain more points. As a result, many people tend to speak very quickly during their Speaking responses. On the other hand, other people who are nervous or not that confident with their English may speak very slowly, stumbling over words or with long gaps in their responses. Neither of these situations is what you want. Both rushing through words and struggling to find the right one can lose you points. You want your responses to sound as close to a native English speaker’s as possible, which means speaking at a normal, steady speaking pace. Practice will help you get better at keeping a steady pace. On the day of the exam, listen to what you sound like when you respond to the first task, and make corrections on future responses to improve your speaking pace. If you’re feeling nervous, take a few deep breaths during the preparation time to help calm your nerves. A lot happens during the Speaking section, and there isn’t a lot of down time to process it. The section is only 20 minutes, but during that time you’ll have to frequently switch between listening, reading, taking notes, and speaking. With all that going on, it can be easy for you to get distracted and let your mind wander. However, it’s very important to stay focused during this section. You can get away with taking a 30-second break during the Reading section or while writing your essay, but the TOEFL Speaking section has so much happening so quickly that even getting distracted for a few seconds can hurt you. You could end up missing part of an audio recording (which won’t be replayed), not having anything prepared when it comes time to speak, or, worst of all, having a blank stretch during your answer where you don’t say anything. Do your best to avoid this. Doing practice TOEFLs will help you get used to staying focused,and, during the exam, you’ll be coming off a 10-minute break, which will help. Use the break to relax, take a mental breather, and prepare yourself for 20 minutes of focus during the Speaking section. The TOEFL Speaking section is intimidating to many people, but if you prepare well, it doesn’t have to be! It’s important to understand each of the question types you’ll be seeing and how you should approach each one. During your studying, you should be sure to speak English regularly, answer practice questions, and expand your vocabulary. Once you make it to the day of the test, follow our TOEFL Speaking tips and remember to use your preparation time wisely, speak at a steady pace, and stay focused. If you put the effort in to be well-prepared for this section, you may find the Speaking section to be the easiest part of the entire TOEFL!